This is the moment the New Zealand mosque killer's rampage was cut short as armed police arrested the terrorist who slaughtered 50 worshipers including children, a renowned heart surgeon, a talented sportsman and dozens of other people whose identities are still being confirmed. The confronting image shows two officers surrounding 28-year-old Brenton Tarrant who is wearing military style clothing. 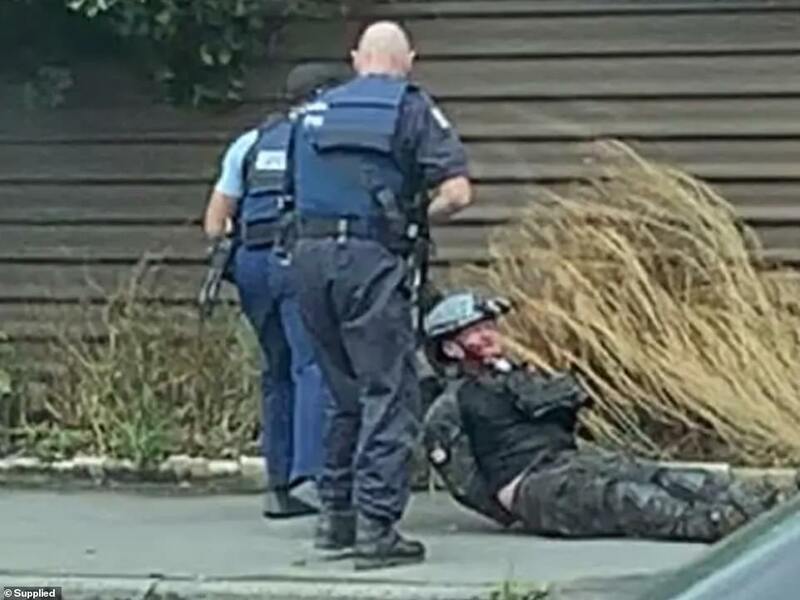 One officer can be seen restraining Tarrant who was pulled from his car after his rampage at the Al Noor Mosque on Friday. Fifteen of his 50 victims have been identified by shattered family members, including Palestinian surgeon Dr Amjad Hamid, 57, who had moved to New Zealand with his wife for a better life, and Kuwait futsal goalkeeper Atta Elayyan, 33, who had recently become a father. Hamid, a respected cardiologist, and Elayyan, a national-level futsal player, have been identified as victims of the Christchurch mosque massacre - as a confronting new picture of the killer's arrest has emerged. Australian Brenton Tarrant appeared smirking in court charged with murder on Saturday morning after he opened fire at two mosques in New Zealand's worst ever mass shooting the previous afternoon. Another believed to be among the dead is Bangladeshi Husna Parvin, who was reportedly gunned down as she tried to save her wheelchair-bound quadriplegic husband from the shooter. Three-year-old Mucad Ibrahim was also named among the dead after he passed away in the arms of his father and brother, who only survived because he played dead. Saturday night's protests were taking place in Pakistan against the shooting and many mourners gathered to comfort the father of Syed Areeb Ahmed, who was a Pakistani victim of the shooting. Many held banners which included photos of the aftermath of the attacks, and some even included pictures of the killer which included a red hand print over his face. Protests were also being held in Istanbul, Turkey, which condemned the violent attack. People could be seen burning flags which had been printed with the face of Brenton Tarrant, while others held lit candles and created signs. Tarrant live-streamed his sickening attack on Facebook in which he killed dozens of Muslims during Friday prayers using four guns at two mosques. Fifty people have been confirmed dead as of 8am AEDT, with another 36 remaining in hospital, 11 of which are in intensive care fighting for life. A further 60 people remain on the official missing persons list, with hope dwindling for distraught family members who haven't heard from their loved ones. Desperate pleas for information are intertwined with tributes for the dead, as thousands across the nation mourn. Kuwait national futsal player Atta Elayyan is among the dead, according to local reports. He described himself as an 'innovator' and an 'entrepreneur', but was best known by New Zealanders for his work on the futsal pitch. A national-level goalkeeper who also played for the Canterbury men's team, Elayyan was remembered by former teammates as an 'inspiration'. 'My brother, I had the privilege of sharing the court with you for over seven years. 'Learning together, training together, playing together and most importantly, building a friendship that will last a lifetime. 'You are an inspiration to everyone and the nicest, most caring person I've ever come across. A tragic three-year-old 'died in his father's arms' during the New Zealand mosque terror attack with his brother only surviving the horror by playing dead, a friend has revealed. Mucad Ibrahim was attending Friday prayers with his father and older brother Abdi Ibrahim when a gunman stormed the al Noor mosque in Christchurch and opened fire on the worshippers. It's believed that at the time of the horrific attack, Mucad ran from the gunman while his father and brother played dead. His family had been desperately searching for him in the wake of the shooting, but have now paid tribute to the youngster on Facebook. 'Verily we belong to God and to Him we shall return,' Mr Ibrahim said, adding: 'Will miss you dearly brother'. On Saturday morning, a friend confirmed Mucad had died the previous evening in his father's arms. 'Mucaad Ibrahim sadly passed away in his fathers arms, last night, and was taken away by staff,' he said. 'RIP my little friend, you will be sorely missed by all. Such a beacon of light,' he added. Since Mr Ibrahim confirmed the tragic passing of Mucad, well-wishers have been paying tribute to the little boy. 'My heart aches for you and your family. Nothing I can say can help, but my sincerest condolences,' one person wrote. 'So sad to hear about your loss, may his soul rest in peace, may Allah give patience to your family,' another added. A third wrote: 'Sorry [you] lost your brother abdi . Such a sad time . Stay strong and love to you and your family'. Another of the victims is 57-year-old cardiologist Amjad Hamid. The Palestinian national had moved to New Zealand 23 years ago because he wanted a better future for himself and his wife. He has not been seen since the Friday attacks and his family believe he has died. 'It's terrible ... we were hoping to find a better future for us and for the children we were planning to have,' his wife Hanan told The New Zealand Herald. She described her husband as a 'very kind man', who is leaving behind two sons, 20 and 22. Haji Daoud Nabi, 71, Naeem Rashid and his 21-year-old son Talha are among those now named. With Abdul Hamid, Khaled Haj Musatafa and Ashraf Ali also among those thought to be dead. And also today, tributes were paid to Sayyad Milne, who is just 14-years-old, both thought to have died in the tragic shooting. Mr Nabi, a father-of-five and retired engineer, moved to New Zealand from Afghanistan in 1977 and set up a new life as one of the 'first Muslims in New Zealand'. Two of his sons Omar Nabi, 43, and Yama Nabi, 45, appeared outside Christchurch District Court on Saturday morning where they shared photos of their father. The pair were told to expect the worst on Friday afternoon after their father hadn't returned from his Friday prayers. Naeem Rashid, from Abbottabad in Pakistan, was hailed a hero after he tried to wrestle the gun from the Christchurch shooter on Friday. He was badly wounded after he launched himself at the shooter in a bid to protect fellow worshippers. He was rushed to hospital following the attack, but later died. Mr Rashid worked in Pakistan at a private bank before moving to Christchurch where he worked as a teacher. Almost all mass shootings are fake. Like Sandy Hook, Parkland, Orlando, Pittsburg, Las Vegas etc. And now probably New Zealand. Only a fool would trust any government. ...and if not faked, carried out by the government, and then they set the narrative as to what happened. I wouldn't trust the government on any level, for anything.